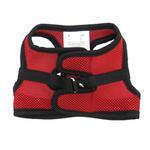 Get out and enjoy the summer days with your dog safe in the Step-in Cirque Dog Harness in Red by RC Pet Products! Your dog will look more fashionable than ever while staying secure and comfortable in our Step-in Cirque Dog Harness in Red. 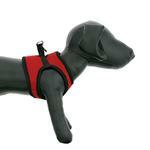 This stylish harness is perfect for nervous dogs since it doesn't go over their head. It's also great for people with reduced hand mobility since it secures with a hook & loop closure! 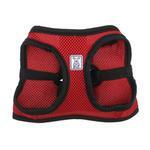 Simply have your pet step in the leg holes and encircle your pet with the cushiony comfort. The double touch fastener tabs are easy and secure. 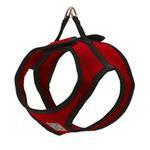 The nickel-plated double D-rings are reinforced into the strong nylon webbing to provide a sturdy leash attachment. The breathable air-mesh fabric is soft and comfy and perfect for use in warm-weather conditions. Its soft neckline eliminates pressure points. The chest logo is reflective for increased visibility in low-light conditions. 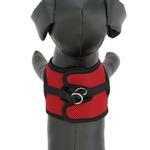 Harness care: Close touch fastener. Machine wash cold on delicate cycle. Do not wash with other touch fastener items. Hang to dry. Do not iron, do not bleach, do not dry clean. If needed, pre-soak in an enzymatic cleaner like Nature's Miracle. Posted On 04/01/17 by Susan R from Issaquah, WA Yes, Susan R recommends this product! We have a new tiny puppy and have been searching for a harness without clips or buckles. This one is perfect. Very secure. I've bought several more in larger sizes so we have one ready for her as she grows. Posted On 01/01/17 by Cindy L from Walterboro, SC Yes, Cindy L recommends this product! Posted On 08/15/16 by Mary R from St. Petersburg, FL Yes, Mary R recommends this product! Ordered XXXS for my other 12 week old Chihuahua/Jack Russell mix. She will have to grow into it, she's a Lil baby. But, we can use it to train her. Very pleased with the color and style. Thank you! !